While pharmaceutical companies toil to develop drugs that will prevent Alzheimer's disease (AD) or tame its symptoms—often taking one step forward and two steps back—some scientists are taking a different tack. Though three promising drugs are on the horizon, many researchers are focusing instead on learning more about modifiable risk factors that can be addressed now, specifically on how nutrition may help prevent the disease or modulate its symptoms. It's increasingly being demonstrated that food is one of the most powerful weapons against many diseases. AD is no exception. In many cases, research results have been encouraging, indicating that nutrition modifications may help prevent the development or slow the progression of dementia. For example, research teams are exploring how the composition of the gut microbiota may give rise to disease symptoms and are looking at the ways it might affect the production of proinflammatory cytokines and the formation of cerebral amyloid-beta. The hope, of course, is that the findings will contribute to the development of novel therapeutic strategies. According to researchers reporting in 2016, study findings suggest that AD may begin in the gut and is closely related to the imbalance of gut microbiota. Modulation of gut microbiota through personalized diet or beneficial microbiota intervention likely will become a new treatment for AD. Walnuts, date fruit, and figs have shown promise in studies of mice for reducing the risk of developing Alzheimer's, and pomegranates were found to slow disease progression, improve memory, and reduce anxiety. Epigenetics has been the focus of considerable research related to Alzheimer's. Studies indicate that nutrition can alter epigenetic biomarker levels, reduce the risk of late-onset disease, and mitigate cognitive decline. Furthermore, researchers have explored the relationship between intake of saturated fats and trans fats and dementia, as well as the role of lipids and fatty acids. They've also explored the effect of dietary patterns, including the Mediterranean diet and plant-based diets, on cognition and dementia. And the MIND diet, which merges the DASH (Dietary Approaches to Stop Hypertension) and Mediterranean diets, appears to slow cognitive decline. Another dietary approach garnering attention and offering promise is the ketogenic diet, known as a treatment for epilepsy, an increasingly popular strategy for weight loss, and a favorite dietary tactic of those wishing to increase athletic performance. 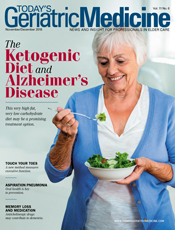 In this issue's cover story, registered dietitian nutritionist KC Wright provides a research update and makes a strong case that the ketogenic diet may be a safe, low-risk, and noninvasive adjunct to pharmacological treatment.